* Check back frequently for more information on Linny's 2019 art shows and events. Rod Charlesworth, Bob Kebic, Darlene Kulig, Linny D. Vine and more ." * Check back frequently for more information on Linny's 2018 art shows and events. Jeffrey J Boron, Robert Genn, Keith Hiscock, Ernest Marza, Linny D. Vine and more ." ​including Rod Charlesworth, Steve Coffey, and Linny D Vine." Find the perfect piece in oil, acrylic, ceramic, glass, wood, metal and fibre. ​Trevor Hunt, Leslie Poole, Linny D. Vine, and others." "This eclectic show will display some of the finest work at the gallery." including Rod Charlesworth, Steve Coffey, and Linny D Vine." between Dallas Road and Fort Street!" ​* * Visit Linnyland AND Linny on the corner of Rockland Avenue & Moss Street - in the same block as the Art Gallery of Victoria, but on the opposite side of the street. * Please note: Artist Location # DOES NOT correspond with street address. 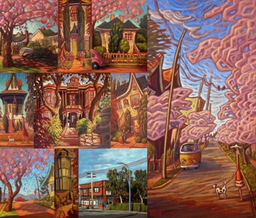 ​*Each and every year Linny has painted a Linnyland Painting of a location from somewhere along beautiful Moss Street. Again this year you can enjoy a visit with Linny in Linnyland, and discover the Moss Street "location" while she creates the 2018 Linnyland painting! and special prices on both Gallery Shop items and works from Art Rental and Sales. "To celebrate Valentine’s this year, Art Rental and Sales is acknowledging unique artist couples from our program. Miles Lowry and David Ferguson, and Linny D. Vine and Jeffrey Boron (in memoriam). Come join us for a glass of wine, meet artists and view their works in the Massey Sales Gallery." * Check back frequently for more information on Linny's 2017 art shows and events. Jeffrey J Boron, Keith Hiscock, Ernest Marza, Linny D Vine and more ." Philip Mix, Linny D Vine and others." Cindy Revell, and Linny D. Vine. just in time for the gallery's group Christmas exhibition!" 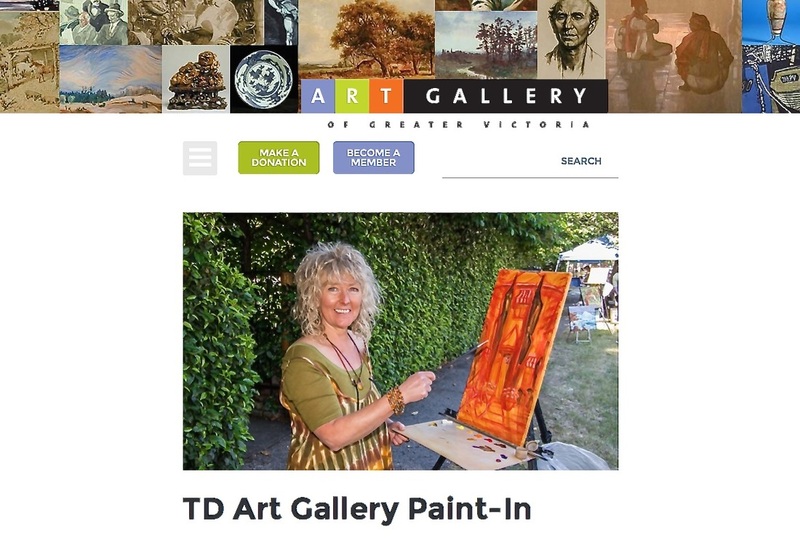 ​"A celebration of all things local, in support of the Art Gallery of Greater Victoria. Held at and organized by the Union Club of British Columbia." ​* Visit Linnyland AND Linny just up from the corner of Rockland Avenue & Moss Street - same block as the Art Gallery of Victoria, on the opposite side of the Moss Street from the Art Gallery. while she creates the 2017 painting! Steven Friedman and Cindy Revell. * Check back frequently for more information on Linny's 2016 art shows and events. Karen Rieger, Linny D. Vine and more." "Feauturing work by the gallery artists." "Hampton Gallery invites you to our 23nd Annual Christmas Show and Sale. Cameron Bird, Philip Buytendop, Steve Coffey, Grant Leier, Linny D. Vine and more." "You know what they say about small packages. ​That’s why, this Canada Day, we’re super excited to showcase our salon-style "SMALLS WALL". ​Mike Svob, Moe Taylor, Linny D. Vine, Peter Wyse and more!" *Please note: this year's Linny/Linnyland Moss Street location is a NEW one! Linny & Linnyland will be located [get this] "half way between Faithful and May" - "Streets" that is! Visit with Linny in Linnyland at 132 Moss Street! enjoy a visit with Linny in Linnyland to discover what she paints at this year's Paint - In! whose paintings are treasured in national and international Collections. ​of her expressive Linnyland paintings. Don't miss your opportunity to enjoy this exciting collection — it's the best of both!" * Check back frequently for more information on Linny's 2015 art shows and events. "Celebrate Winter in all its glory!" 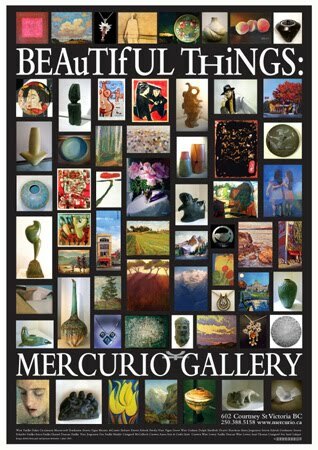 "The best of the best; work from 20 of Vancouver Island's most established and respected artists. Not to be missed if you are looking for an exceptional work of art." "Hampton Gallery invites you to our 22nd Annual Christmas Show and Sale. Cameron Bird, Philip Buytendop, Grant Leier, Linny D. Vine and more." Lando Gallery welcomes Linny D. Vine & Linnyland! Welcome to Koyman Galleries - Linny D Vine! 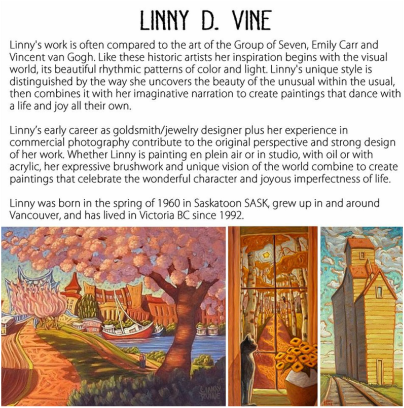 ​"We are delighted to welcome Linny D. Vine to the gallery roster!" 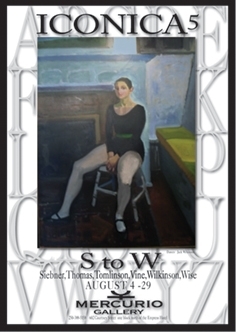 a Summer Salon featuring leading Canadian painters in an outstanding group exhibition. Elka Nowicka, Guy Roy, Claude A. Simard and Linny D. Vine. Accompanying these exquisite painters will be works from an array of glass artists from across Canada including Vancouver Island’s Robert Held, Gabriola Island’s Tammy Hudgeon, Darren Petersen, Paull Rodrigue and David Thai." * Visit Linnyland AND Linny at 1000 Moss Street , the same block as the Art Gallery of Victoria and on the same side of street, too. Welcome to Rouge Gallery - Linny D. Vine! "We are pleased to welcome Linny D. Vine to the gallery roster!" "A new collection of paintings honours the season of gardens and gardeners. Painters from across the country have captured brilliant bouquets and wild flowers bringing a welcome riot of summer colour inside for this eclectic group show. " "British Columbia artists are showcasing their diverse talents in this outstanding group exhibition." 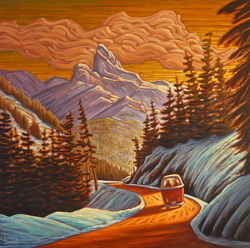 and Peter Wyse are featured... "
"The Adele Campbell Gallery is pleased to be representing this great Canadian artist." "Linny D. Vine's distinctive contemporary paintings are known for their joyful energy. Cherry blossoms in full bloom, adventures in vintage Volkswagen vans, warm curving paths that invite exploration, each building, tree, flower and being alive with it's own special personality. The hour of day and the time of season both captured at their fullest and most colorful. 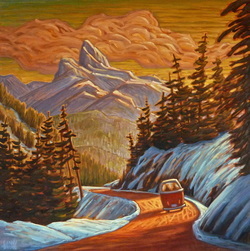 Linny's work is often compared to the art of the Group of Seven, Emily Carr and Vincent van Gogh. Like these historic artists her inspiration begins with the visual world, its beautiful rhythmic patterns of color and light. Linny's unique style is distinguished by the way she uncovers the beauty of the unusual within the usual, then combines it with her imaginative narration to create paintings that dance with a life and joy all their own. Linny has enjoyed numerous successful solo and group exhibitions in public and private galleries across Canada and the USA. Her paintings are treasured in collections throughout the USA, Canada & Europe, and the list of Linnyland Collectors continues to grow. Linny welcomes corporate and private commissions. 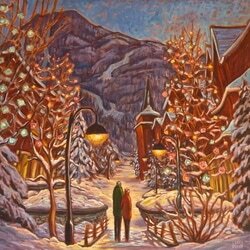 The Adele Campbell Gallery is pleased to be representing this great Canadian artist." producing a special group show and calendar. Claude A. Simard, Deborah Tilby, Linny D. Vine and Peter Wyse." "Hampton Gallery invites you to Deck the Walls with our 21st Annual Christmas Show and Sale. Daphne Odjig, Linny D. Vine and more." still lifes, abstracts, impressionists, urban and figurative styles. Deborah Tilby, Linny D. Vine and Peter Wyse. Paull Rodrigue and David Thai." take their studios to Moss Street between Dallas Road and Fort Street!" on the same side of the street as the Art Gallery of Victoria. "Making a Splash features over two dozen brand new works from Hampton Gallery’s family of artists. Each painting depicts a water theme from whimsical to awe-inspiring." Vine's work is pure joy - joy in colour, style, and composition. and can be just a little bit quirky, too! to inspire and delight, just in time for that special Valentine! used by Nixie Barton and Grant Leier as well as Paul Jorgensen and Linny D. Vine. fused glass sculptures created by Tammy Hudgeon." including Jeffrey Boron, Miles Lowry, Iola Scott, Adam Noonan and Linny D. Vine." and obtain special paintings produced by our beloved artists for this festive exhibition. Delight yourself or that someone special with the gift of art. Michael Rozenvain, Claude A. Simard and Peter Wyse. We are also pleased to have local artist Linny D. Vine participate. a world that celebrates the wonderful character and joyous imperfectness of life. Phyl Buytendop, Robert Genn, Linny D. Vine, Cameron Bird, and more." 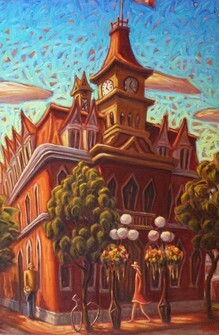 "It's "First Friday Gallery Walk" at all of the Ashland Fine Art Galleries. Join the fun and stop in for refreshments and a visit in Linnyland, in Ashland!" the perfectly imperfect world that we all want to live in." over 100 invited artists take their studios to Moss Street between Dallas Road and Fort Street!" Robert Amos, Linny D.Vine, Adam Noonan, Sheena Lott "
whose paintings are every bit as bright and compelling as her personality. it’s also a direct and personal connection between artist and collector. for their rhythms and lyrical movement, as well as for their gorgeously sunny colour harmonies. an entire world (which she’s engagingly named Linnyland). resting by cool lake shores or at the edge of a grand row of firs. one we’re sure you’ll not want to leave!" "The romance and joy in Linny D. Vine's perfectly imperfect LINNYLAND paintings is irresistible. downtown dates that hint of warm summer adventures to come." Come enjoy a spring fling in LINNYLAND! "Our Diversity Makes Us Stronger"
kind of imagery at the Community Arts Council of Greater Victoria Cedar Hill Gallery. 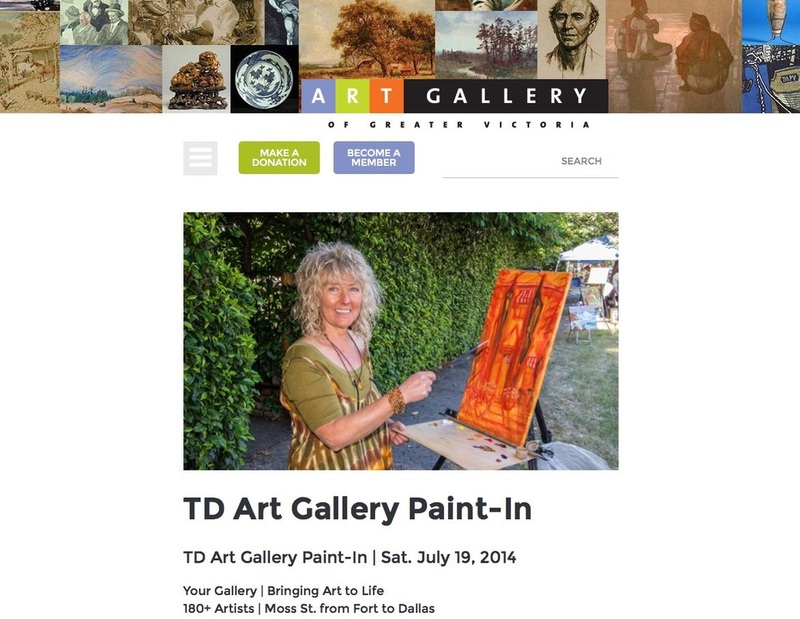 Victoria’s most esteemed women artists, their art filling two of the large gallery spaces." Min Ma, Linny D. Vine, John H. Burrow, Tinyan, Shirley Elias." * Check back frequently for more information on Linny's 2013 art shows and events. Keith Hiscock, Robert Genn, Linny D. Vine, Andres Bohaker, and more." Nancy Rhodes Harper, David Rankin and others". Greta Guzek, Rod Charlesworth, Linny D.Vine, Min Ma, Jessica Hedrick and more." Jeffrey J. Boron, Andres Bohaker, Linny D. Vine, Lisa Riehl, Elizabeth Tanner, and others". "Featuring the work of gallery artists Phil Beck, Linny D. Vine, Nancy Rhodes Harper and others". 'Victoria's premier house tour since 1953, organized by the Gallery Associates. From elegant historical to eclectic contemporary, six unique homes will intrigue you this year. Elka Nowicka, Dorset Norwich-Young & Iris Nardine." Enjoy a visit with Linny (and Linnyland) at the special feature home on Irving Street. four blocks up from the Dallas Road end of Moss Street at station number "104". AND the City of Victoria's 150th Anniversary!" "From A to Izzard in Linnyland"
settings is reflected in the luxuriant colors and rhythmic patterns of their paintings. and Vine with her joy-filled Linnyland Linnyism." "Includes some of Vancouver Island's most established and respected artists. Not to be missed if you are looking for an original work of art to offer as a unique Christmas gift." "My paintings celebrate life with all of it's wonderful imperfections and character. " Life is good in Linnyland. " to visit the meadows, flora, forests, lakes, rivers and sea shores of Linnyland." this much anticipated event showcases well over 100 works of art." (between Faithful Street and May Street). Leclerc Fernand Churchill, Emmanuel Garant, Suzanne Blondin and more". Min Ma, Linny D. Vine, Angela Morgan, John H. Burrow and more." Not to be missed if you are looking for an original work of art to offer as a unique Christmas gift.". between Dallas Road and Fort Street." between Faithful Street and George Street. by some of Vancouver Island's finest artists." Harry Schafer, and Jack Wise & more. and where the sun is always shining. of both the natural and urban landscapes, and a rich and skilfully managed palette." of Fort Street (between Clover Avenue and George Street). Miriam Nelken, and Ron Wilson."